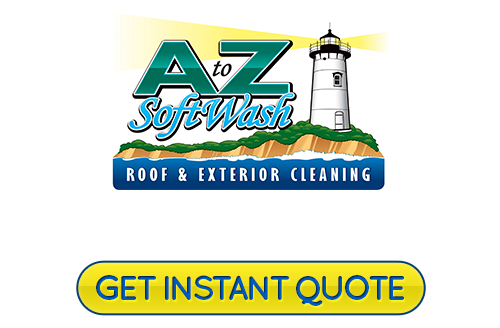 When you are in need of a Cape Cod roof cleaning company, only the best will do. Local home and business owners know that the name to rely on, for this type of work, is A to Z Softwash. Homeowners here take great pride in their homes and why not, there is even a style of house named after the area! So you will feel confident knowing that we also take pride in the work we do. You should never settle for less than the best when it comes to caring for your home, no matter how seemingly trivial the task. Not to mention, your rooftop is the most important aspect of your structure so make sure that it is well taken care of. One of the most common problems you will see with roofs in the Cape Cod area are those black streaks that appear. This is a type of algae that appears and the streaks form when rain causes it to slide down the rooftop. Not only is this unsightly, this pollutant eats away at the asphalt shingles. Did you know that your insurance company could even cancel your policy for leaving your roof dirty? This is because your insurance carrier doesn't want to be financially responsible for roof damage that could have been prevented with professional roof cleaning in Cape Cod, MA. Remove the algae that is compromising the structural integrity of your roof before your insurance policy gets canceled. Some aspects of the exterior of your home require softwashing, in order to prevent potential damage. Yet too many companies stick to high pressured power washing for every task. Since we care about our clients we make it a point to provide the pressure washing service which best works for your exterior cleaning needs in Cape Cod. 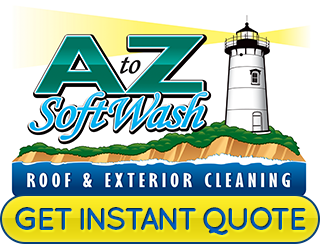 Let A to Z Softwash address your need for pressure washing. Our goal is to make your exterior surfaces look as good as new again, if not better. We offer maximum cleaning without damaging your surfaces. The bottom line is that you need to be able to rely on your service provider to get the best results possible. Don't settle for anything but the best, when it comes to your home or business. For roof cleaning and exterior softwashing, you can count on our team of experts. 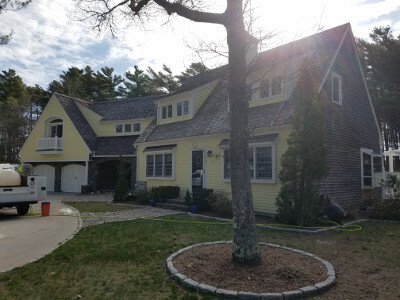 If you are looking for a reliable Cape Cod roof cleaning or pressure washing professional then please call 508-209-7795 or complete our online request form.